We strive to showcase the cool, the unusual, and the high quality in all our foods. At Pangea Kitchen, we strive to showcase the cool, the unusual, and the high quality in all our foods. And one of the areas I think we do this especially well is our meat selection — particularly those on our Neapolitan pizzas and charcuterie boards. These meats are not your standard pepperoni! We buy top quality salamis, sopressata, prosciutto cottos, and much more from a select group of small vendors. These products — from begin to end — are carefully made. The process begins with the hog. When we first opened Pangea, several of us took a whole hog butchering class at Smoking Goose in Indianapolis. One thing that stuck with me was how the level of quality and care that go into the final product. While it’s hard to say exactly how many hogs are processed at their facility, it is a drop in the bucket compared to slaughter houses that can process thousands each day. 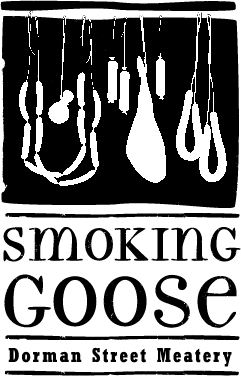 Smoking Goose has developed relationships with small local family owned farms that adhere to strict guidelines. With the meats in hand, our vendors begin creating the cured meats that will eventually land on your pizza. It is a time consuming affair. To make a salami, for example, various meats must be ground to a sausage like consistency, then encased in tubing, salted, cured and hung to dry. The whole meats are a little simpler. A standard prosciutto cotto — which is the rear leg — is cured whole and hung to dry. The curing and drying process does not happen overnight. Our meats are left up anywhere from a month to a year. Obviously, the longer the meat is left, the more flavor characteristics you get (and the more expensive it becomes). 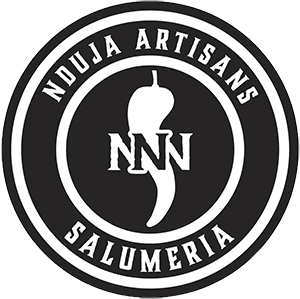 Right now, we stock meats from three small vendors: Nduja Artisans in Chicago, Smoking Goose in Indianapolis, and Charlitos Cocina in New York. The types of meats we have in stock are constantly changing. I strongly encourage you to come and try them all! And, if you love them as much as I do, remember you can buy them on their own from our market, located just to the right of our carry-out register. BAR opens at 4pm and stays open one additional hour. 111 S GREEN RIVER RD.